After a lackluster Black Friday, the 2014 holiday season ending strongly. Though it may be a few months before more analytical research is produced, the preliminary data shows that online sales that consumers turned to the internet to find great deals. IBM, comScore, and Mastercard are some of the companies that released data that can be useful for marketers. Here are eight stats about the 2014 holiday sales season. According to recent data from comScore, the top four online sales day in 2014 were: Cyber Monday (Dec. 1) with $2.038 billion in desktop spending. The day after Cyber Monday ranked second for the season at $1.796 billion, followed by Green Monday (Dec. 8) with $1.615 billion and Black Friday with $1.505 billion. The report from comScore also found that $53.3 billion was spent online via desktop during the holiday season, a 15 percent increase over last year. For the entire season, there were 15 individual days that exceeded $1 billion in online spending via desktop, a 50% increase from the 10 days with similar numbers last year. According to IBM’s sale data, mobile traffic accounted for more than half (57.1%) of all online shopping traffic during the holidays, up 18.6 percent from 2013. IBM’s data showed that smartphones were better than tablets for driving traffic, but the inverse was true for sales. Smartphones drove 40.6 percent of all Christmas online traffic, more than 2.5 times that of tablets, which accounted for about 16 percent. However, tablets drove 18.4 percent of online sales compared to 16.3 percent for smartphones. 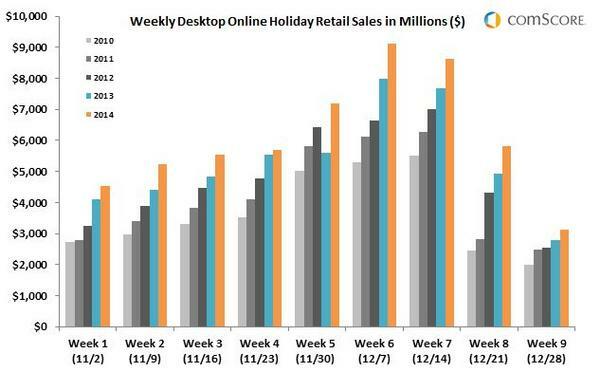 Desktops were still a major factor in holiday sales. IBM reported that desktop PC traffic represented 54.8 percent of all online traffic, and 77.3 percent of all online sales. Furthermore, consumers spent $125.12 per order on average for PC sales, compared to their mobile devices at $104.82 a difference of 19.4 percent. Retail sales in general saw good increases during the 2014 holiday season. MasterCard Advisors said retail sales during Black Friday through Christmas Eve increased 5.5 percent. According to the IBM benchmark data, Facebook referrals drove an average of $89.80 per order and Pinterest performed 10 percent better with referrals averaging $99.86 per order. The data from the 2014 holiday season shows that ecommerce will continue to grow in importance as people use a variety of devices to access great deals on the internet. As business owners head into 2015, improving their websites to increase traffic and improve conversion rates will be essential for success. For some tips on how to that, read this article on how promotions drive consumer behaviors at every stage of the buying process.